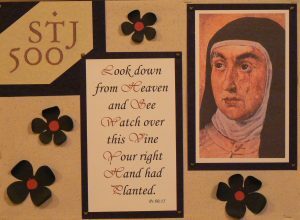 On October 15, 2014, the Solemnity of Our Holy Mother Saint Teresa of Jesus, the entire Discalced Carmelite Order began a Jubilee Year in honor of the 500th Anniversary of St. Teresa’s birth. Events are taking place throughout the world in celebration of this great event of grace. Join us in this year of prayer and thanksgiving that Our Holy Mother will win us all many graces from His Majesty and especially the grace of abundant, holy vocations.